There are many reasons. First, we don’t own boats ourselves, so we are responsible for the full rate of any boat we charter for clients. 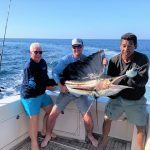 Second, we appreciate you as clients, and want you back for more Costa Rica fishing trips. Therefore we want you to have the captain’s (and mate’s) full and undivided attention, and have your fishing preferences respected. Third, your fishing partners, who might have been charming and courteous at dinner the night before, arrive for the charter with a raging hangover and a disposition to match. Finally, we want YOU to catch all the fish. We suggest this option for one or two anglers: a small boat with an experienced guide at a reasonable rate. 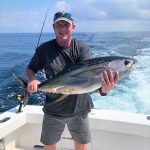 FishCostaRica can recommend boats with excellent captains between 22 and 27ft, and ranging in price from $475.00 for a half day to $1,050.00 for a full day, at or near most of the principal Costa Rica sportfishing destinations. 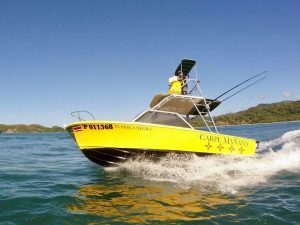 For instance, out of Tamarindo in Guanacaste on the North Pacific coast, there is this 22ft Boston Whaler starting at $475.00 for a half day, $625.00 for a full day. Out of Carillo on the Nicoya Peninsula, this 25ft Towered Bertram (above left) at $550.00 and $775.00 respectively. 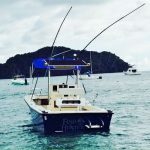 Out of Herradura Bay beside Los Sueños Marina on the Central Pacific coast is this 26ft Fish Nautique (right) at $825.00 for a full day, $575.00 for a half day. And out of Drake Bay on the Osa Peninsula, this 26ft Custom Center Console at $800.00 for a full day, and $450.00 for a half day inshore. So before you ask about sharing a charter, call or email us. 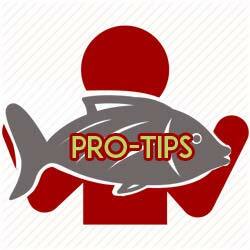 We can recommend preferable small boat saltwater sportfishing options almost everywhere.